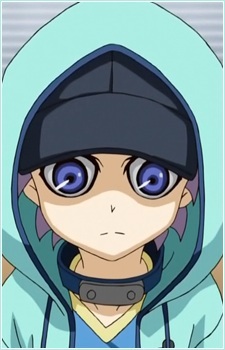 The younger brother of Akaba Reiji, dueling in the Junior class of the Maiami Tournament. He is very timid and shy, always carrying a patchwork teddy bear with him, even going as far as hiding behind its face as the crowd cheered. Later, he is chosen by Reiji to be one of the Lancers, stating that Reira is very important for his plans, especially for the fight against Academia. Reira is actually the adopted son of the Akaba family, an orphan whom they found in a war-ravaged city, alone in a house. The Akabas took him in and ran tests on him. From the tests, his new adoptive mother concluded he would be a perfect Duel soldier for them as he had no "sense of self", meaning he would either be able to become a different person or be a mindless puppet following orders.